All Secure Lock and Security is your trusted, full service mobile locksmith and security specialist. Our showroom is located on the northeast corner of Ward Road and West 64th Avenue in Arvada, Colorado. We sell and service: locks, keys, safes, security systems, video surveillance, and access control systems along with traditional locksmith services. Since 2003, we’ve operated as a family-owned, community-focused business. 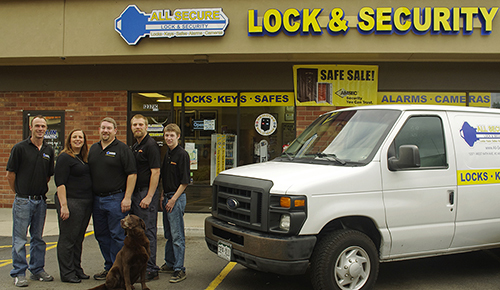 Our locksmiths have a combined 30+ years of experience. Owner Ben Lawrence grew up working in his grandfather’s locksmith shop and quickly learned the importance of honest, reliable service. We have a great team of security specialists; you can be rest assured we will always provide you with our “customer comes first” approach to security!